Date: 1 January 2014. By the Shipyard. For most of us of a certain age, it seems that retrospection is almost a given. I look back at the previous year of 2013 and wonder where the time went. It seems that the clocks spins far faster after fifty than prior to! Still, a lot of wonderful things have occurred and life afloat truly is amazing. The start of 2013 found me not too far west of here in Panama City. At the east end of the town (though in practicality a rural spot) there is a fascinating ship building plant along the north side of the G-ICW*. As depths were good near the complex I chose to the anchor there for a few days. 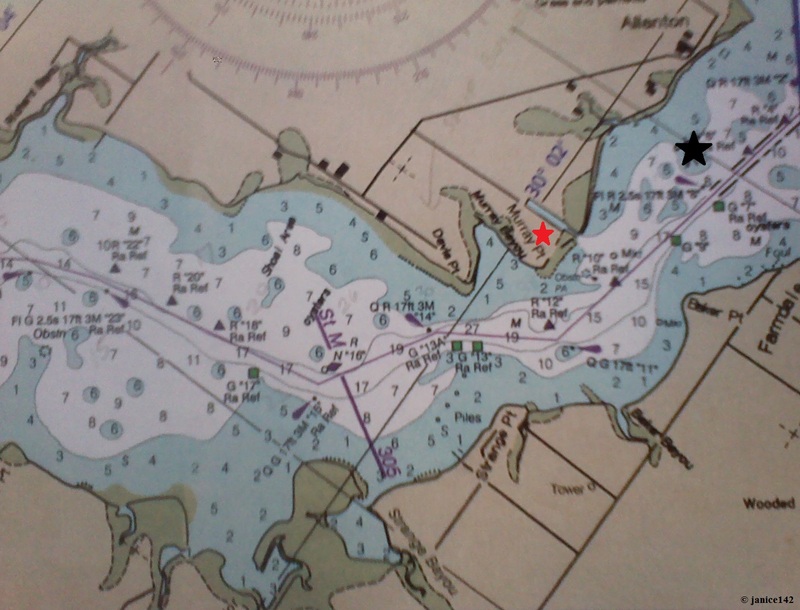 The red star is the shipyard site and I anchored at the black star. The channel by the red star is where the new ships are launched. And yes, I do have a curiosity about the world and like understanding how things work. That in and of itself is a useful trait for a cruiser. It's for certain that items aboard a boat will break and having the ability to figure out how something works and how it might again function is good too. This is particularly important if you do not wish to throw money at every problem. At my end of the financial spectrum that is not a possibility so I learn a bit more. Aside: Quite frankly I know way more than I ever wanted to know about the gasoline beast in Seaweed. And soon enough I'll begin learning about my new-to-me Volvo diesel. I've already had an educational reminder on one thing: Volvo parts are expensive! They are available even for old engines so that's a good thing. My mechanic (Just Right Marine [http://justrightmarine.com] in Carrabelle, 850-697-5366) found all the parts required for the rebuild of both motor and transmission in England for me so progress is being made on that front. According to a Panama City local couple (Frank and Jewell) the boats built there range in size up to about 300'. I will say watching the massive collection of cranes in operation was fascinating. The best part though was the friends I met while anchored there. At about 0800 Skipper and I were getting ready to pull in the anchor and head a bit further east. This spot is exposed and we prefer to be someplace where if the wind blows and the waves kick there is no long fetch to worry about. 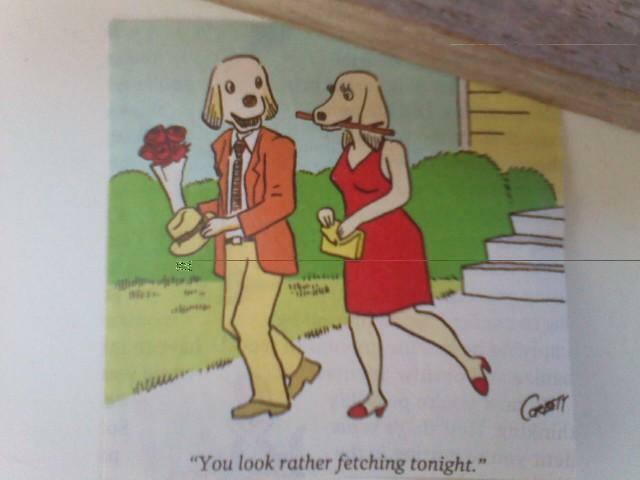 Fetch for land-lubbers is what happens in a place where winds and waves build up due to the topography. For instance, in a place where a river is wide the current often is slower moving. Where the river narrows rapids form. The same amount of water must now flow thru a narrower opening thus the dramatic increase in current. The same funnel-like effect can occur when winds blow thru a narrow area for a long distance. Waves build in front of the winds and it is far more dangerous than in a protected anchorage away from fetch. That's why you'll find experienced mariners prefer those secluded spots without a lot of distant horizon. In any event, I'd anchored in the open near the shipyard to observe and enjoy. The following morning I heard on my VHF a call to the trawler anchored near the building site. That's me! This was literally the first instance on this coast when I was radioed. The best part was the invitation by a river-front "neighbor" to have a cup of coffee ashore. How nice that was! may I remind you that it's just possible you're missing more than you imagine! Frank and Jewell were truly one of the bright spots of 2013 and I enjoyed their hospitality. Being open to new experiences is such a pleasure and I'm grateful for the kindness and friendliness of those on the water. Perhaps one day I'll see you out here too. Happy Cruising! Do you keep the VHF on 24/7 like I do? Have you any further details about the shipyard? I'd love to know more about it. A favorite aphorism: A-1 - Lloyds of London originally used this term in their shipping registry. Ships were graded by letter, and their cargo by number. "A" - ship perfect. "1" - cargo perfect.